This weekend, someone asked me to name three interesting facts about myself. Is it just me, or is it super awkward when someone asks a question like this? It’s like writing your own bio or resume. Suddenly I forget everything that’s ever happened in my life and all I can come up with is my favorite color: purple. Interested? Didn’t think so. “Fine,” I agreed, secretly hoping she’d have something juicy about my past I’d forgotten. But she’s right. When I tell people this, they immediately demand an explanation. “How? Why? What was that like? Why did you leave?” I’m going to break this up into a few different posts to answer these questions so I don’t end up droning on for 100 pages (I’ve been known to do this). Let me preface my story with this: about a year after my move to St. John, I was hanging out with a group of old friends and one of them said to me, “If we were taking a vote for ‘Person from our High School least likely to move to the Virgin Islands to become a bartender,’ you would’ve won.” Which I suppose is what makes this a little more interesting. When I was 22, I moved to St. John, a tiny island in the Caribbean. I lived there for five years (with a quick six month break back in N.C., more on that later). I didn’t have a job, a plan or more than $1,000 in my bank account, but I didn’t worry about those kinds of things back then. The funny thing is, it actually had less to do with moving to the islands than it did my goal to become a career lifeguard. And (you knew this was coming), breakups sometimes drive us to do crazy things. 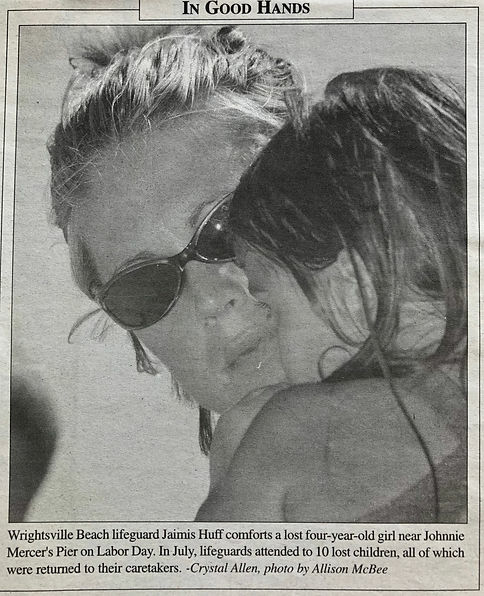 I was on the Wrightsville Beach Ocean Rescue squad every summer in college. I was young, fearless and convinced I was invincible. To be honest, I can’t even believe I had the balls to try out. I wasn’t a particularly strong swimmer. Maybe compared to the average person, but not compared to most lifeguards, who were collegiate swimmers and triathletes. At one point, later in the season, I asked the captain why me? He said I stood out because I tried really hard. I was one of the smallest people at tryouts and I pulled in a guy twice my size. With my bathing suit falling down. Instead of taking the time to pull it up, I kept dragging this dude out of the water. I guess when it comes down to it, not giving up is what matters. I loved it so much and still look back on those days as some of the best. The job was exciting, intense and laid back all at the same time. They taught me what it means to be an athlete. I learned it’s not as much about your physical ability as it is about pushing past the limitations we construct about ourselves in our own minds. They taught me how to run and swim distance and when I was struggling during PT (physical training), they’d come back for me, cheer me on and push me to finish. It was the first time I felt like I had a purpose, and I was part of a team – something much bigger than me. Digging through my old journals and found this newspaper clipping. As graduation approached, I knew I wanted to lifeguard one more summer. My parents understood my love for the job and supported the idea of putting my career on hold until the fall. The plan was to become a copy editor. I studied French and English in school (more writing, less literature). My journalism professor had connections in New York City and said she’d try to get me a job. She helped me put together my resume and convinced me I had a future in the business. My friends all started their grown up jobs within a few weeks after graduation. We were a pretty driven, studious group of women and they were all headed in the direction they were hoping to go with their careers. My Best Friend even landed the “internship turned dream job” at the local tv station. I felt a little like I was falling behind by lifeguarding another summer, but I did it anyway. It didn’t take long, but eventually, I started getting the calls. Meanwhile, I was hanging out at the beach all day, getting paid to workout, save lives and get tan. You spend a lot of time by yourself in those lifeguard stands staring at the ocean thinking about life. I started contemplating my future and what it looked like. Moving to a big city and drowning in words all day started to become less and less appealing. About halfway through the summer, a guard from the Outer Banks was visiting to do some work with the Coast Guard. The Captain sat him in my stand. He was several years older than me and I was fascinated by this. “How is he still a lifeguard?” I wondered. On hour four of sitting together alone in a box, I finally asked. You become pretty close, pretty fast up there. There were way more men than women on the squad, so more often than not, I was stuck with guys who were fine with sitting in silence. Silence got boring after an hour so I’d switch back and forth between playing a game called “Would You Rather” (ex: would you rather drink 2 gallons of saltwater or eat 1 cup of sand? Would you rather be eaten by a shark or run over by a boat?) and philosophical questions about life and where they saw themselves in 10 years. Which is kinda crazy, looking back. Not only did I end up working at Woody’s, but those girls became my best friends, and still are. He asked me what my plan was, and I told him I was questioning everything about my life. As the summer went by, I started looking into other options for being a year-round lifeguard. Maybe I could move to Hawaii? The guys on the squad lovingly told me they didn’t think I could cut it out there. Obviously I was pissed when they told me this and probably accused them of being sexist, but they were right. With those kind of waves, “trying hard” wouldn’t cut it. Then Hurricane Katrina happened. FEMA needed rescue workers and were paying big money for emergency responders to head down to Louisiana. You had to have a partner to go with you. The Captain was looking into going but couldn’t talk anyone into going with him, so I volunteered. He lovingly rejected my offer, and again, I was pissed and definitely accused him of being sexist. Looking back – he’s a 6’4 MMA fighter and firefighter, so guess I can see why I wasn’t his ideal teammate heading into disaster zones. I love my family and friends so much that I should want to stay where I am. But when you’re on your own, and you aren’t surrounded by what you know and don’t have that comfort – that’s when you’re forced to learn about yourself. Who am I, if I’m not Jill & Dave’s daughter, Sam’s sister, a college student, a lifeguard, someone’s ex-girlfriend? It takes a new setting, new characters to figure it out. And the sun and sand and crystal clear water all around me – it’s what I need right now. Let’s hope the islands suit me well. The plan was to head to the islands from October-May, then head back to North Carolina for the summer to lifeguard. But as it turns out, the islands did suit me well. After a few months, I realized I’d found my new home. I’d built a new life on that rock that I didn’t want to leave. You’d be like a butterfly trapped in a jar if you lived a normal life. I’ll leave you with this and share more on what life was like as an island girl in my next post, since this one is already getting pretty long (as I said, I’ve never been called a woman of few words). You don’t always have to have a plan. If you do have a plan, be open to veering off course and seeing where life takes you. We can learn a lot about ourselves when we’re in the transition. We perceive the feeling of groundlessness as something to fear, but it’s not. It’s an opportunity to explore and rebuild. In many ways, I’m in awe of my 22-year-old self. She was fearless. She also thought she knew everything and had it all figured out. If only I could gently tell her she doesn’t but that’s okay because she’s going to be just fine. I’d tell her to relax, take a deep breath and enjoy the ride.